The Drones are an Australian band that rose to prominence in Australia when in 2005 their album, Wait Long by the River and the Bodies of Your Enemies Will Float By, won the inaugural Australian Music Prize. 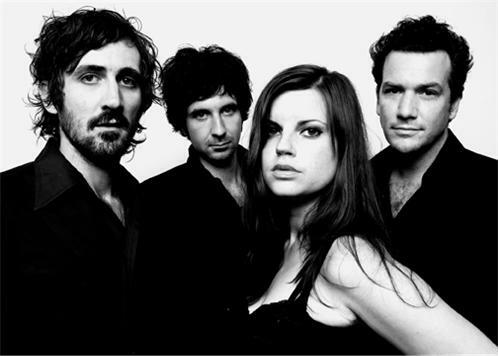 The band consists of vocalist/guitarist Gareth Liddiard, bassist Fiona Kitschin, lead guitarist Dan Luscombe, keyboardist Steve Hesketh and drummer Michael Noga. Sessions for what would become their second album Wait Long by the River and the Bodies of Your Enemies Will Float By were undertaken during 2004. But once the album was completed, the band had legal problems that stalled the release for over a year. Influential Melbourne indie music figure Bruce Milne's In-Fidelity label eventually released it in early 2005, to enthusiastic reviews from the underground music press. The album was also nominated for Triple J's inaugural J Award prize in 2005 (which was eventually won by Wolfmother), and topped many Australian critics' end-of-year Top 10 lists. Furthermore, Triple J put the album tracks "Shark Fin Blues" and "Baby" on medium rotation. During an extensive six-month tour encompassing Europe and the US, All Tomorrow's Parties issued Wait Long by the River and the Bodies of Your Enemies Will Float By outside of Australia towards the end of 2005. Strybosch left around this time to join Dan Kelly and the Alpha Males, and Mike Noga (Sandro) took his place. In 2006, a record of outtakes from Here Come the Lies and Wait Long by the River and the Bodies of Your Enemies Will Float By called The Miller's Daughter was released by Bang! Records (a Spanish label which has many other underground Australian bands on its roster). Later that April, Wait Long by the River and the Bodies of Your Enemies Will Float By won the inaugural Australian Music Prize, in contention were other notable bands such as Wolfmother, The Go-Betweens, TZU, The Devastations, The Mess Hall, Tex, Don & Charlie and Ben Lee. The Drones continued to tour throughout the year, including a support slot on You Am I's Australian tour in July. In September 2009 Wait Long... was performed live in its entirety as part of the All Tomorrow's Parties-curated Don't Look Back series. In a poll of contemporary Australian songwriters organised by Triple J, "Shark Fin Blues", was voted by as the greatest Australian song. The Drones third studio album Gala Mill was recorded in an old mill at Gala Farm in Cranbrook, Tasmania. It was released in September 2006. The album was also nominated for the 2006 Australian Music Prize. The Drones were also nominated as 'Most Outstanding New Independent Artist' at the 2006 inaugural AIR (Australian Independent Record Labels Association) Chart Awards. In late 2006, Liddiard announced that Rui Pereira had left the band, to be replaced by Dan Luscombe (The Blackeyed Susans, Dan Kelly and the Alpha Males, Stardust Five). Luscombe debuted for The Drones at the 2006 Meredith Music Festival. In July 2008 The Drones released a digital/12" EP featuring new songs "The Minotaur" and "Nail It Down", the first songs from their next album, Havilah. Havilah was released 20 September 2008 in Australia, with a worldwide release following in February 2009. The band undertook a national tour to promote the album in November, performed at the Falls Festival in December and toured Australia in February 2009 as part of the St Jerome's Laneway Festival.